Backyard Bird Loveee Feeder are a great way to enjoy nature right next to your home. 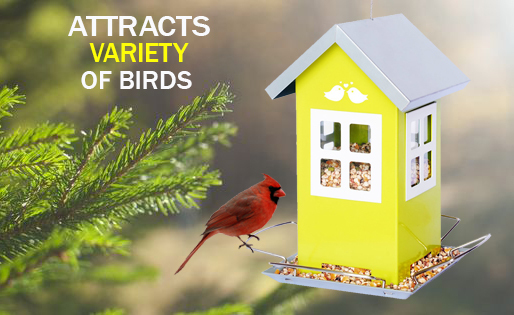 If you love nature and animals you might think about hanging a bird feeder in your yard. Every birder know that birds are a great way to educate your children and help your colorful friends. Picking the right bird feeder can help you avoid a lot of frustration., what you want is durable, strong and quality product that can last for years. Bird Loveee might be just what you need. This cute little bird feeder comes in yellow/green color with a silver/blue color roof. The feeder comes with four feeding ports from where the seed flows down and four stands for birds. About 3-4 birds can feed in the same time from the feeder, this will prevent birds fighting for food. On the sides there are seed level monitors shaped like little windows, it is a cool design feature. There are drainage holes in the bottom to prevent the seed to get damp after rain or snow. The feeder is made of metal and will resist rain, snow or wind. There are 4 feeding stands where birds can easily stand. Little song birds like sparrows, chickadees and finches will have no problem using this as their lunch stop. The feeder looks robust and will not brake when dropped full of seed. The roof is made to be lifted and pour the new seed, this is easily done by kids or elderly if you plan to gift it to your parents. It is on the smaller size compared to some other feeders so this might deter some birders, you will have to refill more often. This Bird Loveee Feeder comes with a strong hanging wire. I recommend that you hang the feeder in some open area with a clear view. This will prevent cats from sneaking up and jumping on the birds, cats are hunters and love moving objects. Hang the bird feeder away from strong wind direction, this will prevent seed to spill to much on the ground and save you some money. What birds can the feeder attract? Cardinals, titmice, nuthatches, grosbeaks, chickadees, finches etc. You will attract lots of birds with sunflower seed , and bird seed mix. Bigger bird will have trouble landing on small stands. The feeder is made of metal and color coated. You can easily hand wash it with soap, make sure that it is rinsed well so no soap is left behind. I don’t recommend you use a dishwasher. Dry it well before you pour seed. This Bird Loveee Feeder is not squirrel proof, so I recommend that you pace it so the squirrels cannot jump on it. Getting a squirrel baffle or placing it on a pole can deter squirrels. Do you get the value for your money? This cute little bird feeder looks lovely and looks like a great gift. 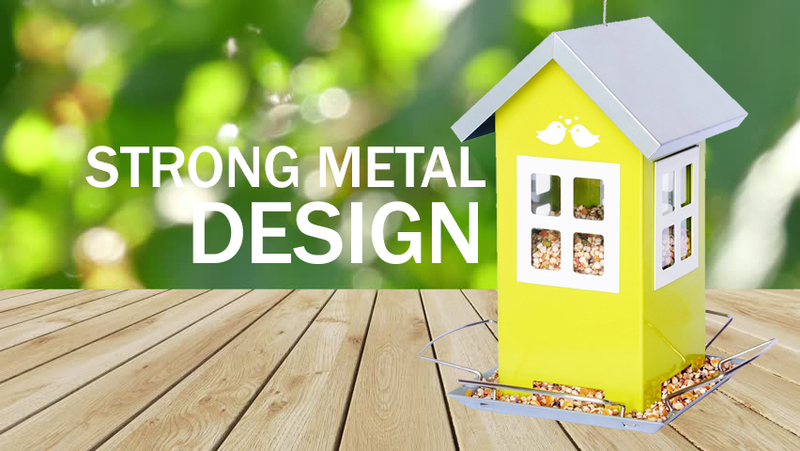 It is durable and will not brake if dropped, the metal construction is strong. It is on the smaller size and you have to refill more often that with some bigger sizes. The quality compensates its smaller size and I think it looks adorable in the backyard. Check the Bird Loveee Feeder price here!